“Anchoring” is a Powerful technique in NeuroLinguistic Programming; in NLP, “anchoring” refers to the process of associating an internal response with some external or internal trigger so that the response may be quickly, and sometimes covertly, reaccessed in order to elicit a specific behavioral outcome. Tactile: Perceptible by touch or apparently so; tangible. First of all, I know we are not dogs; however, concerning stimulus>response we are very similar, and that is why Anchoring works. Pavlov showed the existence of the unconditioned response by presenting a dog with a bowl of food and the measuring its salivary secretions (see image below). However, when Pavlov discovered that any object or event which the dogs learned to associate with food (such as the lab assistant) would trigger the same response, he realized that he had made an important scientific discovery. Accordingly, he devoted the rest of his career to studying this type of learning. Pavlov knew that somehow, the dogs in his lab had learned to associate food with his lab assistant. This must have been learned, because at one point the dogs did not do it, and there came a point where they started, so their behavior had changed. A change in the behavior of this type must be the result of learning. In behaviorist terms, the lab assistant was originally a neutral stimulus. It is called neutral because it produces no response. What had happened was that the neutral stimulus (the lab assistant) had become associated with an unconditioned stimulus (food). In his experiment, Pavlov used a bell as his neutral stimulus. Whenever he gave food to his dogs, he also rang a bell. After a number of repeats of this procedure, he tried the bell on its own. As you might expect, the bell on its own now caused an increase in salivation. So the dog had learned an association between the bell and the food and a new behavior had been learned. Because this response was learned (or conditioned), it is called a conditioned response. The neutral stimulus has become a conditioned stimulus. Pavlov found that for associations to be made, the two stimuli had to be presented close together in time. He called this the law of temporal contiguity. If the time between the conditioned stimulus (bell) and unconditioned stimulus (food) is too great, then learning will not occur. Pavlov and his studies of classical conditioning have become famous since his early work between 1890-1930. 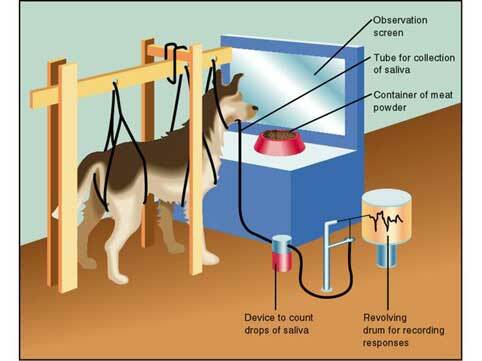 Classical conditioning is “classical” in that it is the first systematic study of basic laws of learning / conditioning. Practice the Technique (Live Demo) By now, you must know how susceptible humans are to Visual Anchors; we, as a species, are all very good at remembering important things we SEE. Therefore as the “Influencer,” you focus on using a Visual Anchor when you want the mind of the listener to SEE more closely the idea, product, behavior, belief, substance, situation, relationship, etc. that you are desiring to Anchor to their brain. I like to use a specific hand gesture to create clear Frames of Reference and to set Powerful Visual Anchors as demonstrated in the Video below around 7 minutes into the Workshop. Verify the Efficacy: Since you don’t have the person you are speaking to connected to a monitor to measure the amount of salivation that you are generating (Pavlov throwback,) you will have to learn how to calibrate the listener. If you have not learned calibration, please checkout the YouTube Video I produced with Young Businessmen of Tulsa YBT President Matt Moore by clicking HERE. *Use the same format to create and implement Auditory & Kinesthetic Anchors just like the Visual Anchors you have begun creating, and if you would like a demonstration on How to do this effectively, watch the video I included below and Enjoy! ← Are You Being Judged?